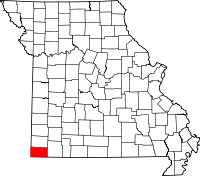 McDonald County, located in the very southwestern corner of Missouri, borders Arkansas to the south and Oklahoma to the west. Several local agencies handle record keeping and distribution for the county. The Recorder of Deeds, in charge of maintaining property, marriage, and other records, is in the County Courthouse on 602 Main Street in Pineville, and is open Monday through Friday from 8:00AM until 4:00PM. Sharing space in the courthouse is the Circuit Clerk, in charge of civil and criminal records, such as divorce, probate, and other types. The Clerk's office also shares the same operating hours, except is open a half hour later, until 4:30PM. Also in Pineville at 500 Olin is the McDonald County Health Department, the county indexer and provider of birth and death records, however the state of Missouri has fairly strict requirements that must be met in order to obtain copies of vital records.